For sixty years, the Los Angeles area was served by a vast network of electric railway lines operated by the Pacific Electric Railway. 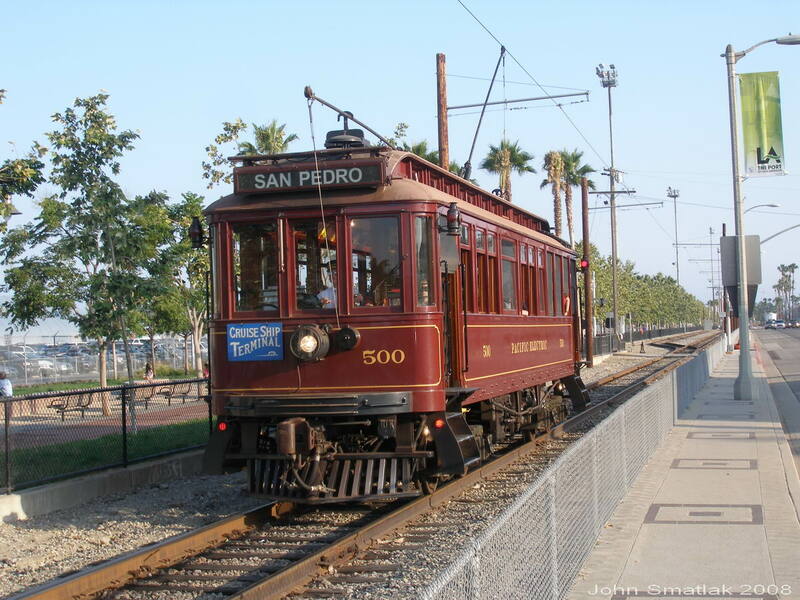 Affectionately known as “Red Cars”, the Pacific Electric’s trolleys and interurban cars blanketed the Los Angeles area on more than 1000 miles of rail lines. The last remnant of the system was abandoned in 1961. 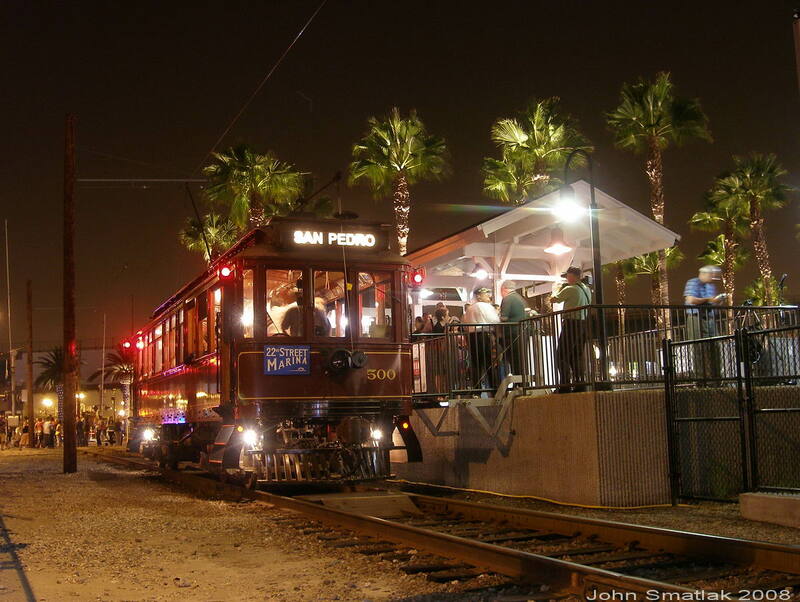 Forty-two years later, a small piece of the system has been resurrected in San Pedro, as the Port of Los Angeles Waterfront Red Car Line. 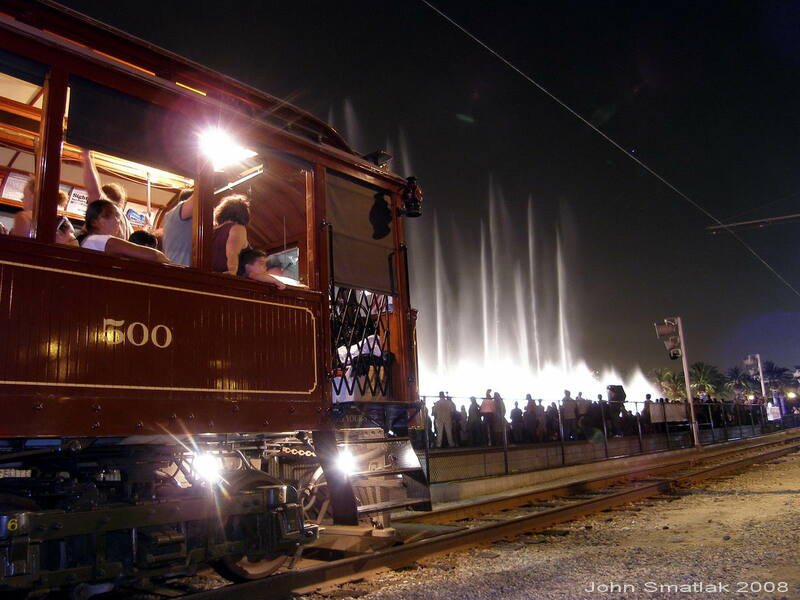 Riders can experience the thrill of a real 1920s-era trolley ride, thanks to the remarkable railcars that have been built to serve the line. Regular operation is conducted with two new replica railcars carefully patterned after an actual 1909 Pacific Electric “Red Car” design. 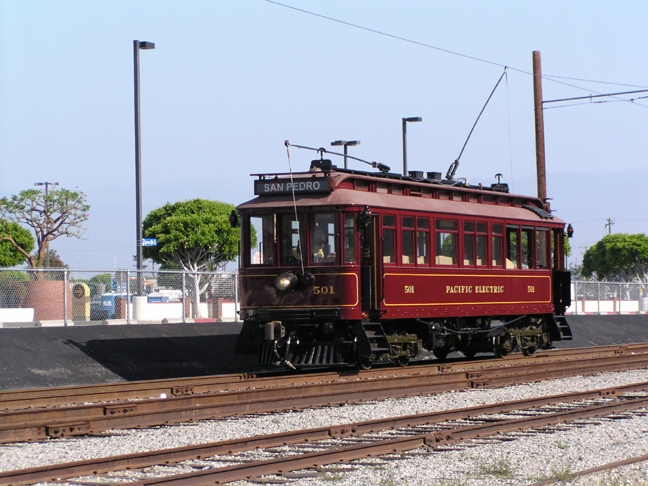 A third car, restored in the 1960’s from an actual 1907-vintage Pacific Electric car, is available for special operations including charters. 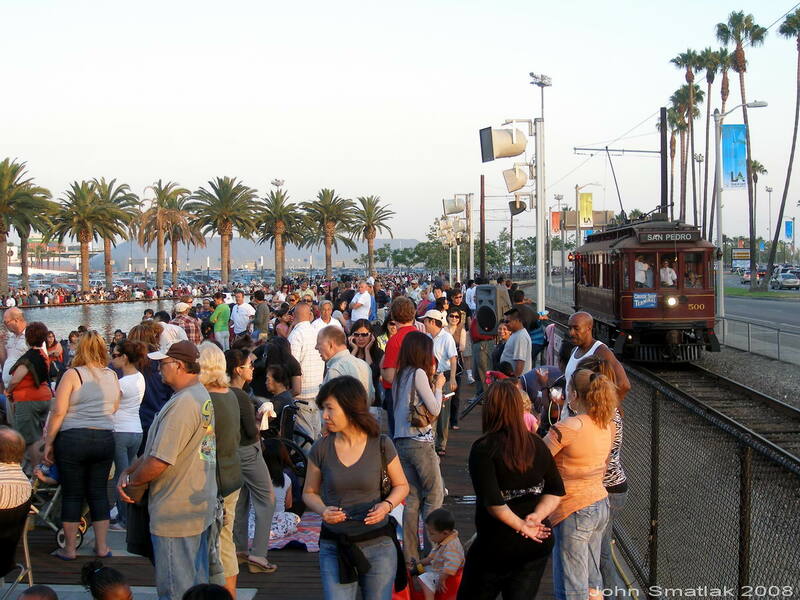 The 1.5 mile line connects San Pedro’s cruise ship terminal with other attractions along the waterfront. The $10 million dollar project was financed and constructed by the Port of Los Angeles, the independent City agency which manages the bustling port facility. The line uses parts of an old Pacific Electric right-of-way that continued to be used for freight operation long after the original Red Cars were gone. 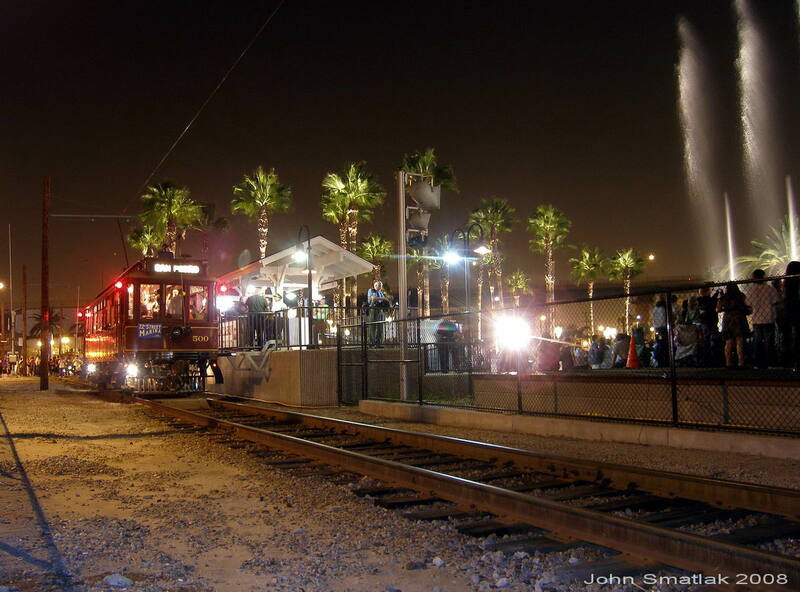 The line was rebuilt to accommodate trolley operations with traditional 600-volt DC overhead trolley wire. The four stations feature ADA-compliant high-level platforms that make boarding and alighting easier for everyone and the new cars easily accommodate wheelchairs. The line opened for public operation on July 19th, 2003, following a three-year construction period. 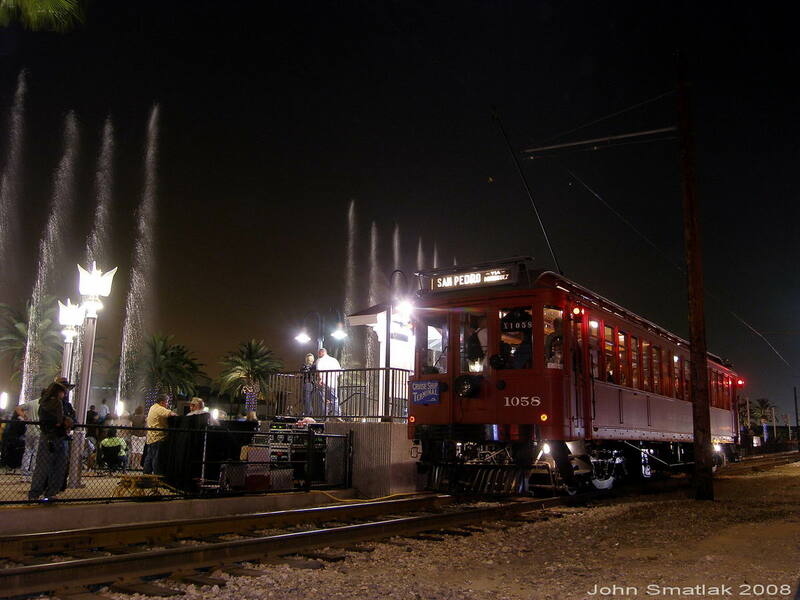 Railway Preservation Resources served as a consultant to the Port on the project, and extensive details can be found on the Port of LA Waterfront Red Car Line pages, located elsewhere on the website. Scenes along the Red Car Line July 25, 2008. Fountain opening ceremony. 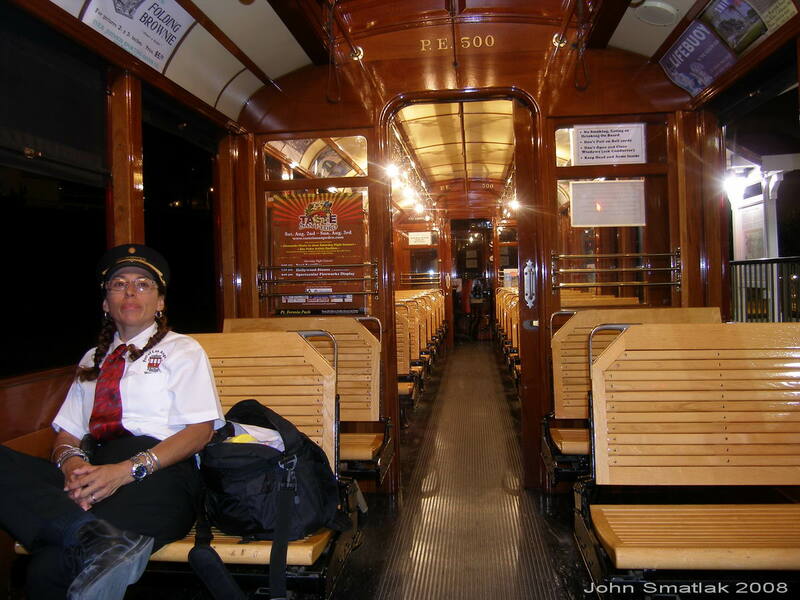 August 2003- The Red Car Line celebrated its first anniversary with a special weekend of free operations. The weekend included a “special guest” trolley from the Orange Empire Railway Museum and also featured the public debut of replica car 500. Additional details on the event are available here. For the line’s first full year of operations, a total of 87,621 passenger boardings were recorded over 127 operating days, a daily average of 689 boardings. November 2006- Harbor Commission Approves Expansion Study. At its 11/16/06 meeting, the Harbor Commission approved a contract to study expansion of the existing Waterfront Red Car Line. The study will examine a variety of route proposals, and develop concepts for enhancing the role of the Red Car Line in local transportation. Prime contractor Wilson & Company has teamed with EDAW, Railway Preservation Resources, Stone Consulting, LTK, Aztec Engineering, and other local firms to provide a expert team to address the study issues. October 2007- The Red Car Line carried just over 10,000 passengers for the weekend of Lobster Festival, September 15-16, 2007. The system operated with extended hours for the three day event, and provided an important (and fun) parking shuttle service for festival goers. In other Red Car news, work continues on the system expansion study, with the consultant team now finalizing their findings for presentation to Port staff. With the announced closing of Westway Terminal in 2009, and the resulting end of rail freight service in San Pedro, a number of new alignment concepts have now been opened up. Adjacent to the line, work is well along on the new water feature that will be the icon of the new Waterfront Gateway at the entrance to the World Cruise Center. The Port is also moving ahead with a number of other significant community improvement projects in San Pedro and Wilmington. 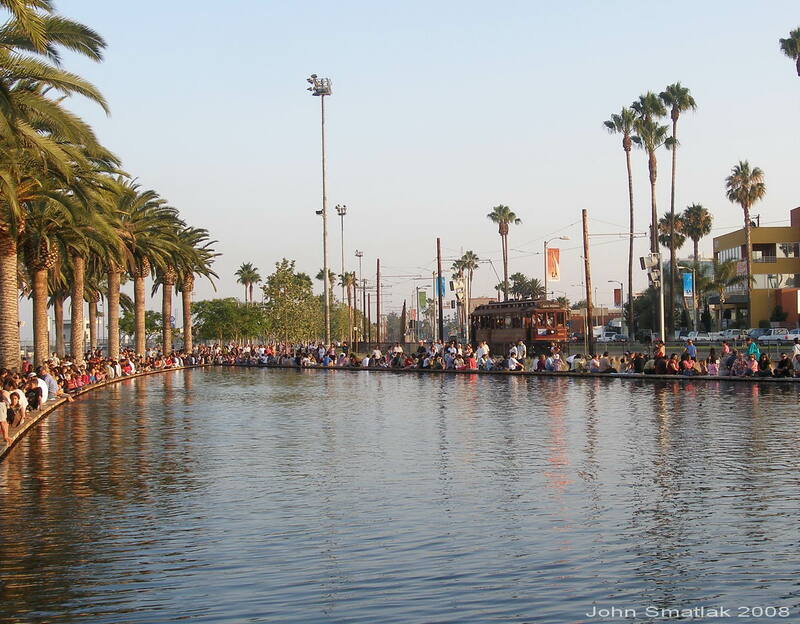 The Gateway water features are the latest milestone in the ongoing program to create a world-class waterfront in the San Pedro and Wilmington communities. “Performances” occur daily, more information on the fountain is available on the Port’s website. In other Red Car news, work continues on the system expansion study, with preliminary alignments now being designed for the extensions that are covered by the San Pedro Waterfront Project EIR.